On your next visit to Thailand, make sure you check out the beautiful island of Phuket and the gorgeous beaches of Phang Nga. These beaches are like nothing else in the world, with stunning rock formations that jut out of the turquoise sea. This incredible part of the world has been the backdrop for some of the most famous movies and television shows in the world, including the Bond series. Aside from soaking in the majestic scenery, Phang Nga Bay is a beautiful place to get your dose of Vitamin Sea and relax on some of the most picturesque beaches in the entire world. The weather in Thailand is warm and balmy throughout most of the year and the Thai islands, including Phuket, are renowned worldwide for being uniquely spectacular. 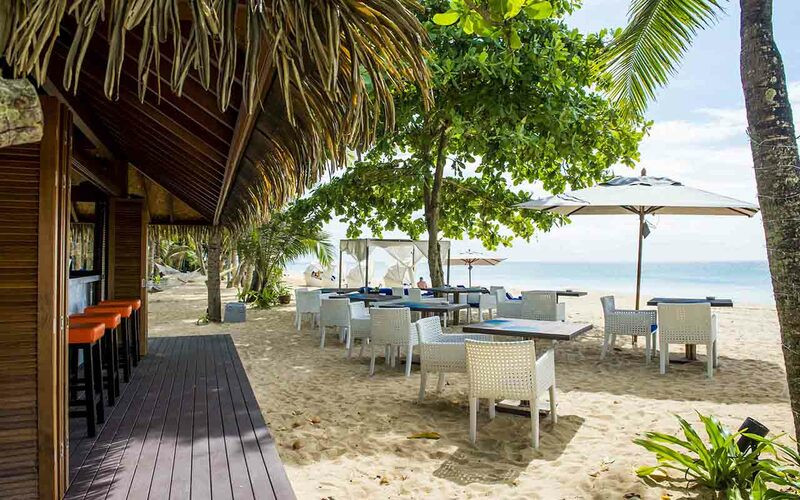 Make some time to savor some of the finest beachside dining available in Phang Nga. Not only will you eat great food, you will also have a front row seat to the ocean! We have compiled a list of some great restaurants available in Phang Nga. If you are looking to soak in the sun, and sea in the lap of luxury, Akrya Beach Club is the best place to grab a delicious meal! With an eclectic and exquisite menu, live music and an extensive cocktail menu, you can't go wrong with this seaside gem. Make sure you check out some of the best favorites on the menu, like Crab And Mango Salad which pairs creamy soft shell crab with green mango and signature dressing. It is a refreshing beachy bite. Also recommended is Akrya Beach Club's Monster Burger, a pure Australian Wagyu beef patty crowned with cheddar cheese, fresh avocado, grilled onion and crispy pork. It's topped off with spicy and smooth chipotle mayo. For dessert, the Triple Chocolate is a winner. With three decadent types of chocolate in one incredible cake, the Triple Chocolate is a dessert lover's heaven! Ao Thong Beach Restaurant is one of the best-kept secret on the beach, the place where locals go when they want to eat fish fresh out of the ocean or sample Thai favorites like Papaya Salad. Laid back and relaxed, Ao Thong Beach Restaurant is a great place to kick back and eat some great local food. You will find a mix of locals and tourists at this Phuket hot spot. Try their flavorful Papaya Salad, which is served with a sprinkle of peanuts for a fresh crunch. Barbecued Fresh Tiger Prawns are a must also. Fresh and pulled recently from the ocean, these prawns are gigantic and juicy. Another specialty of the house is Deep-Fried Chicken With Tumeric. The turmeric gives the dish an earthy kick that is perfectly complemented by the delicious fried chicken. You can't go wrong at this restaurant! Walker's Inn prides itself on being an authentic, reasonably priced option for people who are looking for Thai food or Western food in Phang Nga. Their dishes are always well-portioned, satisfying and are sure to fill you up! Their Thai food is the type of comfort food that you will crave long after you leave the beach. Try the Chicken Massaman, a golden chicken curry full of potato and peanuts, along with a heaping spoonful of white rice. Their Phad Thai comes with a heaping portion of prawns, pork, chicken or beef and is a great rendition of the classic Thai dish. Vegetarians are not left out at Walker's Inn! They have ample options for people who do not wish to eat meat, including a savory and multi-layered Green Curry that is served with a generous helping of vegetables and mashed potatoes. This off-the-beaten-path restaurant boasts spectacular views and a menu that is second to none! With Western and Thai favorites and a great beer and cocktail selection, Memories Beach Bar is a place that you will want to return to again and again. Some of the best food is eclectic and a fusion of Western and Thai cuisine, like the Ham and Cheese Spring Rolls. These Spring Rolls are certainly a crowd pleaser, combining Western flavors with an Eastern technique. For a more authentic dish, try their Prawn Spring Rolls. Pulled fresh from the sea, the prawns are succulent and sweet. Another stand-out dish is the Fried Rice With Prawns. The Fried Rice is light and flavorful, not heavy like some dishes, and the crowning topping of Prawns makes the dish sing! Wash it all down with a local beer or one of their Fresh Fruit Shakes that come in a number of different tropical flavors. Delicious! For high-end beachside dining, you have to check out Esenzi. Their cuisine is whimsical, deeply thought out and beautifully presented. They only use the finest ingredients so each bite is perfectly designed and orchestrated to appeal to your taste buds as much as possible. Also, Esenzi has a glorious dining area where you can sit in splendor as you sample their innovative offerings. You will not be disappointed. Try the Wagyu Beef With Eggplant, Kimchi, And Spring Garlic, a perfect bite that combines melt-in-your-mouth premium beef with tangy kimchi and earthy eggplant. A touch of spring garlic makes it sing. If you are in the mood for seafood, the King Crab With White Curry, Ikura And White Tumeric is an excellent choice. The crab is sweet, fresh and recently pulled from the water and it pairs splendidly with the tumeric. If you want to have dessert, try the Banana with Salted Caramel, Burnt Honey, and Coffee. The unique combination might seem a little unorthodox, but it is completely on point. The EDGE offers Asian inspired contemporary food with a western twist or possible western style with an Asian twist. The amazing thing about this restaurant is that where possible all of the vegetables are from their own garden, and you can taste it. Lunch offers a selection of health snacks, salads and starters, to more substantial grilled items and even oven fired pizza (try the prosciutto pizza). Dinner is where the magic happens at the EDGE when the Michelin styled menu really provides an evening of textures and tastes. We shared the roasted rib eye and oh my, what an experience. This is a lovely restaurant but be aware that it is inside a large resort. Open all day it offers indoor and terrace seating and is western inspired menu with their own twist on some of the classics. I enjoyed the Charcuterie plate and enjoyed grazing through this with some chilled sauvignon blanc. They do offer pizza, pastas and although I did not try them, the burgers looked scrumptious. There is an extensive menu, so you should easily find something and also very child friendly. There are so many amazing dining options available in Phang Nga. You can dine right on the beach and soak in the atmosphere as well as sample some amazing cuisine. Whether you are in the mood for Western fare, Thai traditional favorites, or an innovative fusion of both, you can find what you are looking for right at Phang Nga.